Many years ago, when I started coaching, I was very ambitious and pushed my athletes very hard. But soon, I realized that, if I wanted the best results from the team, I couldn’t be the one who always pushes. I learned that the most effective driving force is the one that comes directly from the athlete. But what determines how driven an athlete is? In my experience, the answer is self-confidence. I spent many years trying different strategies to teach self-confidence to my athletes. Over time, I came to understand that self-confidence is directly related to our sense of control and power over our performance. The more you perceive that you have power over the events in your life, the more you feel in control, the more you are willing to make efforts to progress, because you know that you have the means to take up the challenges that are presented to you. One way to increase your sense of control over your performance is to train regularly in the appropriate action area. In this zone, you feel very comfortable, you feel little or no stress, and you don’t feel much stimulation. For example, you could find yourself in the Comfort Zone when facing weaker opponents than you, or when practicing a drill you have done many times. In this zone, you are in control, but you know you have to give your very best to take on the challenge in front of you. You feel stimulated, you have butterflies in your stomach, and you view it as “good stress.” You feel confident that you have the means to reach your goal. You could find yourself in the Performance Zone when practicing a new drill, or when facing a very good opponent that you know you can beat if you play well. In this zone, you feel like you have to give 110% to defeat your opponent or reach your goal. You are at the limit of your capability (or the perception that you have of your capacity) and you feel that you have absolutely no room for error, otherwise everything could collapse. You may feel frustrated, anxious, or stressed. You could find yourself in this zone when playing a big game in a new role, or with a new team, or when facing a great opponent in quarterfinals…any time you feel something important is at stake. You could also find yourself in the Panic/Frustration Zone when you feel you have no control over the outcome of the game. For example, your team is making unusual mistakes and you are trailing behind in a game you could win if your team would play the way they usually play. Frustration arises, and you start doubting you will accomplish your goal. 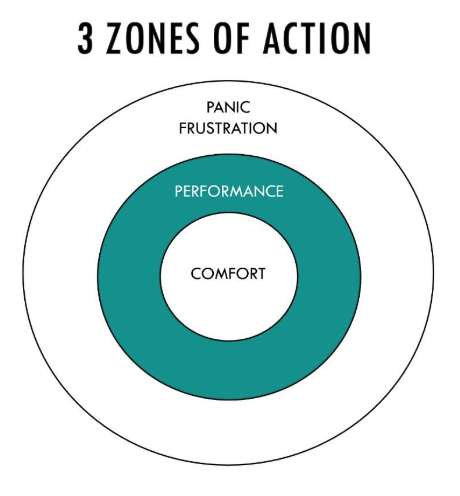 When you feel stressed, anxious, or negative, or when you are so tense that your technique is affected, it is very likely that you are in the Panic/Frustration Zone. The best way to increase your chances at success is to bring yourself back to the Performance Zone, where you feel positive stimulation (not overstimulation, i.e. being too emotional) and in control. Here are four ways to do so. It is good to set high goals and expectations at the beginning of your season. It gives you a direction and helps you take action. But when you are entering your game (even the week before), you must let go of expectations. The more energy you spend holding onto your goals (like winning) and expectations, the less energy remains to focus on your actions in the present moment. When you stop focusing on expectations, you free your mind. Your head is clear and you are then able to make decisions quickly, with less fear and more accuracy. When you don’t feel in control, when there is no room for error, when you are under the impression that you must give 110% to reach your goal, it is normal to feel “pushed to the limit.” As soon as something goes wrong, you think that everything is over and that you will fail. Your goal must be attainable even if mistakes are happening along the way. Let go of the outcome, lower expectations, and redirect your focus in a way that you must give your best without asking for perfection. If you are performing in a new role, recognize that you can’t be perfect and give you time to learn and adjust. Make a plan to peak at the right time in the season, and set small goals to help you progress one step at a time. If you play with a new team, accept that you need to build connection and chemistry, and that in the meantime there will be turnovers due to miscommunication. Focus on improving communication and knowing your teammates instead of perfection right from the start. When facing a strong opponent in the final, acknowledge that both teams are great and that both can win this game. Let go of the outcome. Don’t be intense about the results and the score; instead be intense about executing your preparatory routine, playing hard on defense, and syncing up your cutting. Set big goals for yourself about things you do really well under pressure. When you feel your team isn’t performing the way it could, recognize the things you don’t have control over and let go of them. Focus on your play, your sideline, and your behavior as a teammate. If you give 100%, your efforts and energy will positively influence others. Dwelling on the negative will not. Maybe you feel stressed because you want to meet other’s expectations: ‘what will my teammates think of me if I miss this throw? What will my coach do? I can’t let my team down…’ When these thoughts cross your mind, ask yourself what you want for yourself, and what you need to perform at your best, and keep focusing on that. Nothing else. Please others is not something you can control. Sometimes, we feel anxious or frustrated because we feel stuck…we think we don’t have the resources to perform or to help in this situation. Maybe it is time to develop new skills. It could be to learn to communicate with your teammates so you perform better as a team on the field (so you won’t feel frustrated because everyone seems to be out of sync). Ask yourself: what do you need to feel fully in control? What should you develop? Your knowledge? Your leadership skills? Your technical or tactical skills? Your physical preparation? Your ability to communicate your needs or your ideas to your captains and coaches, so you can get better support from them? Make an assessment and go get the tools or skills you need. You will then feel better equipped to meet your challenge. If you are performing in a new role, you may need to get more coaching and experience, watch videos, read articles to learn more about this role. By doing so, you will feel more in control and increase your self-confidence. If you play with a new team, you may need to go out with your teammates, ask them questions and get to know them better, on and off the field. You may need to take time to observe their playing style and talk with them to know, for example, what they expect from their cutters when they get the disc. When facing a strong opponent in finals, you may feel more confident if you took some time before the game to watch their previous games, either on video or throughout the tournament. If your opponent is known to be very athletic, it is possible that your stress comes from a lack of confidence in your fitness. Make sure you train appropriately before your tournament and you will feel much more in control. When you feel your team isn’t performing the way they could, you may need to learn to connect and communicate with your team. You could develop your leadership skills so you have a greater influence when the going gets though. You can also work on being able to give your best no matter what is happening around you. This is a powerful way to bring your team back on track. It is possible that you set very good goals and that you have the resources, but you don’t really believe in yourself or your capabilities: maybe you think some of your teammates don’t trust your skills, maybe you think you are not a very good defender, maybe you just don’t know what your strengths are. Take the time to analyze the situation, talk to people you trust, and get a better picture of yourself as an athlete, a leader, or a teammate. Remember Dr. Ivan Joseph’s definition of self-confidence: the ability or the belief to believe in yourself, to accomplish any task, no matter the odds, no matter the difficulty, no matter the adversity. When you train in the Panic/Frustration Zone, your progress is slowed down by your limiting beliefs – what you think you can (and can’t) accomplish and how you think the things should be done. Your strong emotion is like a fog preventing you from viewing the big picture and accessing all the solutions that are available to you. When you train in the Performance Zone, you feel much more confident that you can reach your goal, because it feels more accessible to you – although not too accessible. It is still a challenge and it brings the best out of you. You are willing to spend more energy on solutions. Your inner talk is then empowering and encouraging – not stained by fear, stress or frustration. What makes it so powerful is that every time you train in your Performance Zone, you expand it. Every little success helps you make your way toward your goals. Over time, your Performance Zone will become so big that you will definitely believe in yourself, to accomplish any task, no matter the odds, no matter the difficulty, no matter the adversity. That is how you build real, long-lasting self-confidence. Guylaine Girard is the former head coach of the AUDL's Montreal Royal. She lives in Montreal and has been coaching for 25 years. You can download her free ebook for coaches, check out her blog and follow her on Instagram. Comments on "Tuesday Tips: Four Ways to Break Out of the Panic Zone, Presented By Spin Ultimate"